New Delhi: Heaps of plastic waste including plastic bottles, cups, straws, and wrappers dumped by the roadside, littered around his residence, in the local park, near public offices, around schools and in the nearby forest too prompted 58-year-old Usham Krishna Singh to act. Resident of Chingkhu Awang Leikai, Imphal East, Manipur, Mr Singh learnt about the dangers of plastic pollution when the Government of Manipur announced a complete ban on the use of plastic bags in June 2018. He also learnt from the Directorate of Environment of Manipur that five per cent of the total solid waste generated per day by Imphal city is plastic. The newly acquired information made him question the ban which made only plastic carry bags illegal while plastic bottles which make up a huge part of the plastic litter in the region was not banned. I have fond memories of rivers and drains flowing freely and during floods, they brought plants and insects to the land. But now, the rivers seem so choked with garbage and floods bring mounds and mounds of plastics. There is a big lake in Manipur, Loktak Lake, which can be called the lifeline of Manipur. Most of our waste goes in this lake, thereby posing serious threats to the environment and ecology of Manipur. To save our Lake and environment from pollution of plastic waste materials, I worked on the idea of making brooms out of plastic bottles. Initially some people mocked me when I used to collect disposed of plastic bottles from streets in my bag every time I used to go to work or to run an errand or just for a stroll. But it did not discourage me. Rather, I used to feel even more motivated to try harder in my pursuit of building a machine for recycling plastic. With time people of my village understood me and now some people even bring empty plastic bottles to my home. Mr. Singh works as a pump operator in the Water Supply Department under the Public Health Engineering Department, Government of Manipur. His son Ashok runs an electronics repairing centre. Using the technical knowledge about machines, they successfully created an apparatus for recycling used plastic water bottles into brooms after hard work of three months. Elaborating on the procedure of making the broom, Mr. Singh said he uses a horse-knife with the help of which the plastic bottles are sliced to very thin pieces, almost in the form of threads. The plastic threads are then made rigid by applying hot air-gun used by Ashok in repairing mobile phones. He uses bamboo sticks to hold the plastic threads. For manufacturing one broom, 30 bottles of one-litre capacity are required. We are still experimenting and trying new things. Due to financial and technical limitations, I have confined the workshop to using only plastic bottles to make brooms. But I hope to widen the scope of my work and use other plastic items which are disposed of as waste, especially the single-use plastic items like straws, cups, plates and carry bags and make more products out of those. Even though income generation was not the primary motive, I am happy to see that we are able to provide a source income to people of my village. 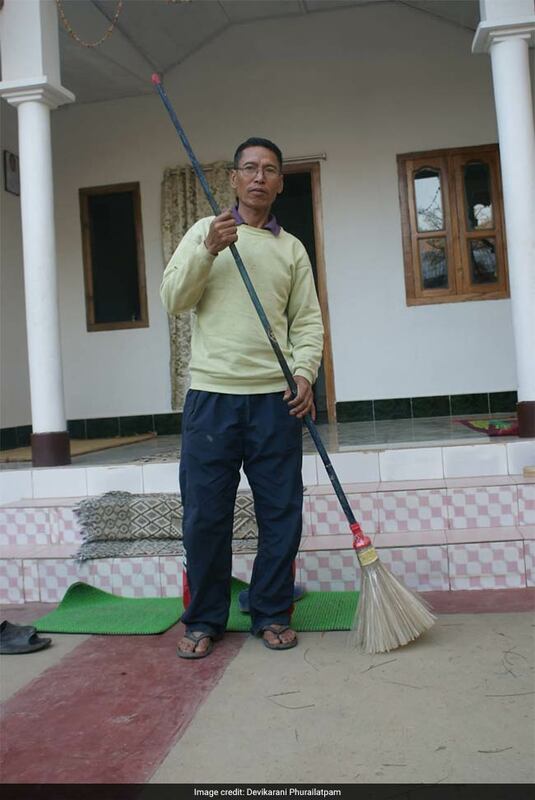 He further said that the demand for his brooms is increasing in not only his own village but some of the nearby villages too. They have also started selling the brooms in city markets. Mr. Singh and his team are currently making two kinds of brooms- one by using waste plastic water bottles selling at a price of Rs.150 and the other with soft drinks plastic bottles selling at a price of Rs. 200. 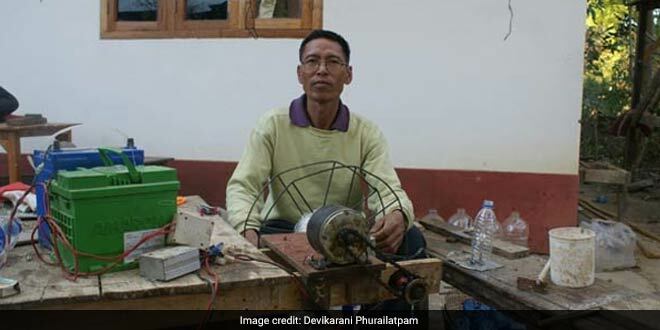 Mr. Singh has, till date, made 500 brooms and has invested around Rs 20,000 for the whole set up for recycling, which includes the cost of the motor, other parts of the machine and raw materials like nails, wires, and bamboos. 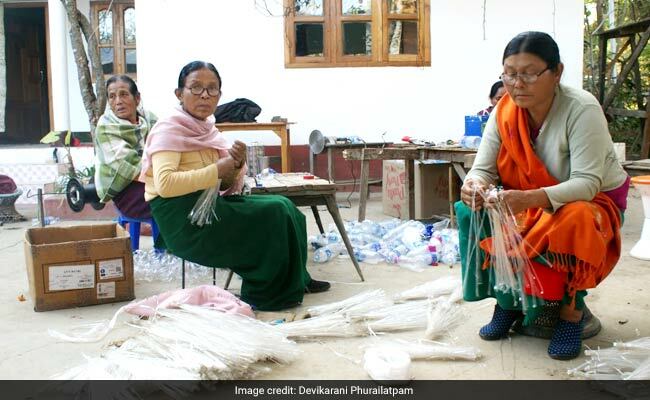 With the tagline-‘If you love your future, love your environment’, the SHG formed by Mr. Singh aspires to include more people to have more hands in the battle against plastic pollution in Manipur and in the process also try and help the economically weaker sections of his village earn some money.